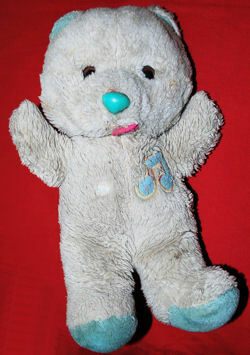 I’m looking for a white teddy bear that has blue on the feet and ears. It has a blue music symbol where the heart is. It has a silver wind up in the back, and it plays Brahms lullaby. The Bear is about 23 years old. I’ve had it since I was a baby. The bear is probably about 12 inches, and it means the world to me. I want to either find another one, because I want to pass it on to my kids ( I have a 3 year old and a 9 month old), or I want to find that type of music box that plays the song exactly like mine plays it.